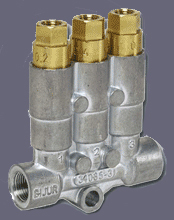 The ZEM Series PDI injectors are available in four different models. Each series is capable of discharging oil or light grease (up to NLGI 00). They discharge between (0.01~1.5cc) depending model.